I have a confession to make. I’m not really a fan of baked goods that are not sweet. However, Caroline was busy this weekend and so I offered to give this recipe a try. I read some really positive comments from some of the other bloggers, so I thought maybe this recipe would be a turning point in my need for baked goods to have chocolate, caramel, fruit,etc. I bought a tiny little bag of wheat germ at Bulk Barn and got to work on these cookies one night this weekend after work. I halved the recipe because of my apprehensions about the recipe and truth be told, I am glad I did. I know some people enjoy less-sweet desserts but I guess they are just not my cup of tea. Maybe I did something wrong in the baking or perhaps I’m just not in love. However, the cookies did bake up very well and looked quite nice appearance wise. The poorly lit cookies. I can't wait for spring! Oh well, you can’t win them all! You can head on over to Michelle’s blog for this recipe. It can also be found on page 81 of BFMHTY. p.s. Sorry for the less-than-stellar photo but it has been a grey couple of days here in Ottawa! Chocolate Banana Pie: Our First Guest Post!!!! I definitely prefer the martini glass presentation, as it gives me an opportunity to use copious amounts of graham crumbs! Please note: be sure to keep the portion sizes to a minimum. Though this dessert looks like a pudding or a trifle, it’s much heavier than it looks. A little goes a long way! I improvised some dark chocolate chips on the top of the whipped cream. Serve with… Sri Lankan deep-fried meat pastries, in my case. 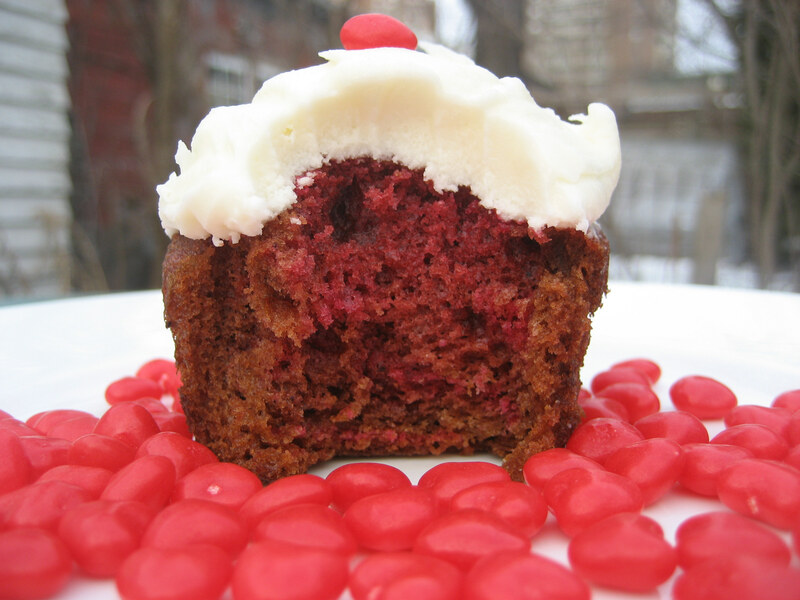 After all, what’s a Valentine’s Day without a little indulgence? 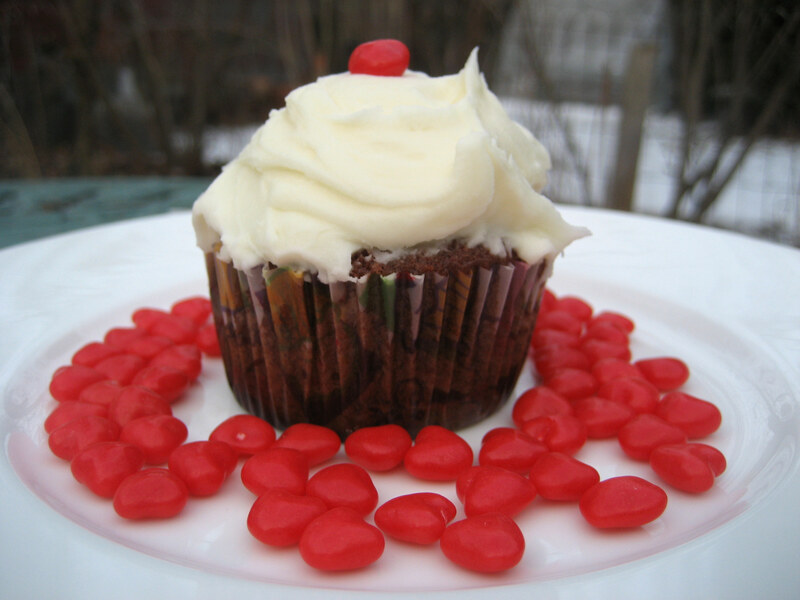 Editor’s Note: Special thanks to my favourite baritone saxophone player for a) making me this Valentine’s Day treat and b) blogging about it. This past week was filled with more baking than usual. I made cookies and cupcakes for work, two TWD recipes and some lemon squares. Let me tell you, my trainer would so not be happy about the “choices” I made. That being said it was fun to bake up a storm and I really couldn’t send my baking out into the world without taste testing it. I made Dories Best Chocolate Chip Cookies with my niece. 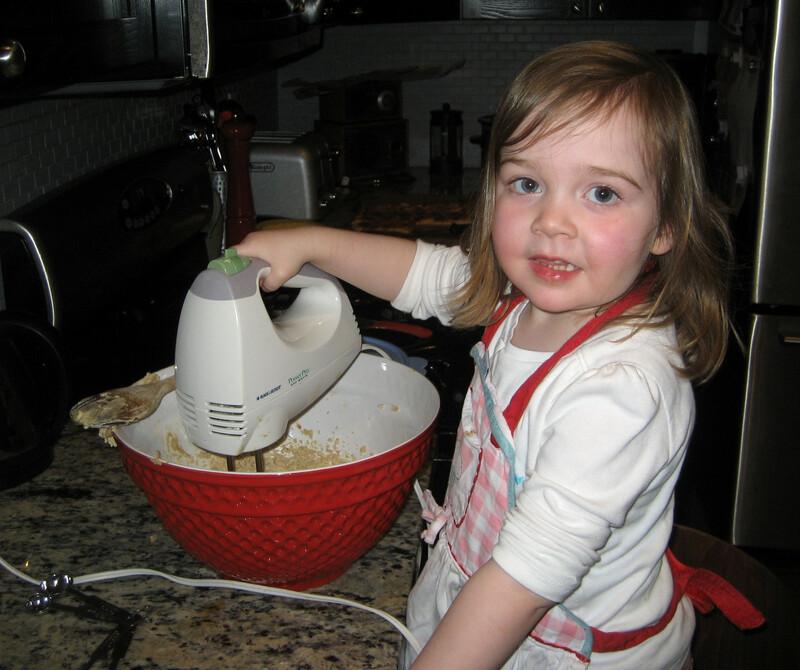 We love baking together and she is getting to be such a big girl that she was able to use the hand mixer all on her own. Here is evidence. Fortunately, I had a party to go to on Sunday so I was able to bring plenty of baked goods with me, including these cookies. I have to say that although these are really good, I think I prefer my own go-to chocolate chip cookies (everyone is allowed a personal preference, right?) 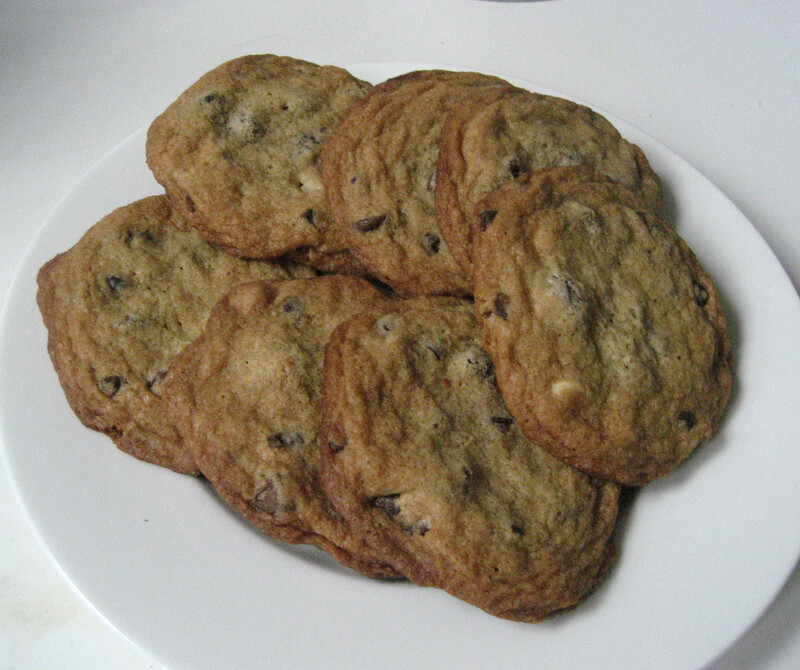 I used a mixture of semi-sweet, milk and white chocolate chips which added a little something extra. These are a crispier cookie so if that is what gets you going you won’t be disappointed. Head on over to Kait’s Place to see the recipe and what this week’s host, Kait, got up to. To see what other TWD bakers did, check out the list of participants, you may just find a new favourite blog. Happy Valentine’s Day! I admit I am a fan of Valentine’s Day. I have spent many a Valentine’s Day single and many in a relationship so I get both sides of the story. I just think a day about love can’t be wrong. Whether you get wrapped up in the commercialism of it is your choice but devoting some time to sharing the love has got to be good for the world. This past week was my Snack Friday and Jen, my coworker and Winner’s Buddy, agreed to join in on the fun. I think I have mentioned it in the past but my library celebrates Friday’s with eating and socializing, how cool is that? When I realized our Snack Friday was close to Valentine’s Day Jen and I decided to go with a theme. We thought we would bring out the kid in all of us by baking sugar cookies and having people decorate their own. To document the fun we brought along a camera and had people take photos of their creations. My coworkers are very creative and we had a great time decorating and documenting. I am lucky to work with such great sports! Jen and I used Martha Stewart’s Sugar Cookies from Martha Stewart’s Baking Handbook. You can find the recipe over here. A couple weekends ago, one of my co-workers had a potluck at her house. 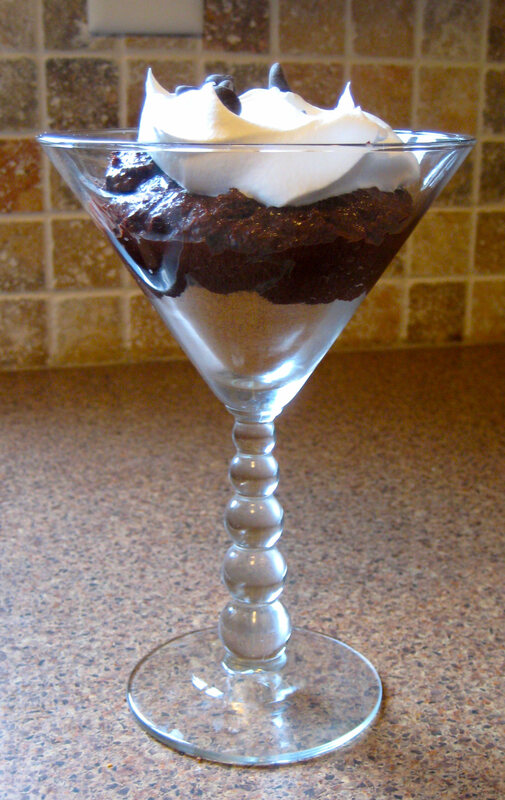 I was quick to offer to make dessert and chose this recipe right away. I had previously tried to make this recipe the weekend before but had a few mishaps (including using the wrong appliance to mix and rushing too much!). Thankfully, the recipe turned out for the potluck (not so great for my company the weekend before who had no dessert!). This recipe comes from the bf’s mom. 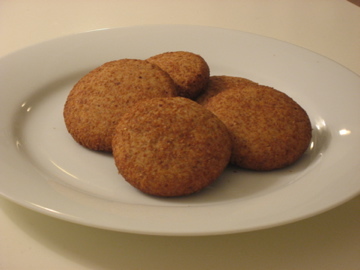 She is a great cook and baker and I have been meaning to make this recipe since having them at her house. 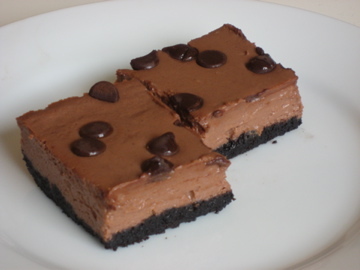 It combines my love for squares and cheesecake. Mix together oreo crumbs and butter and pat into 8×8 pan. Set aside. Mix cream cheese and sour cream until smooth. In a separate bowl, combine cocoa, corn starch and sugar together. Add dry ingredients and eggs to cream cheese mixture. Pulse to combine. Pour over base. Sprinkle the chocolate chips over the top and bake at 350 degrees for 35-40 minutes. So last night, as I was making these, (three cheers for me for getting them done before Tuesday) I was talking to S. and when I told him I was baking brownies, he attempted to get me to drive to Oakville to bring him some. A taxi service, I am not, but these were very tasty so I can’t fault him for trying. We have a party on Sunday so I used an 8 x 8 pan for the majority of the batter and made some brownie tarts for him. 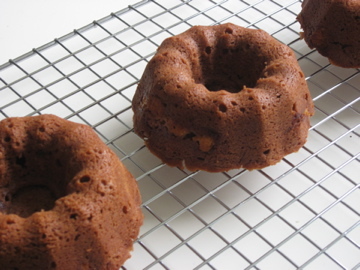 I had to try a little so I made a mini bundt for me. Thank goodness for a multitude of baking pans. 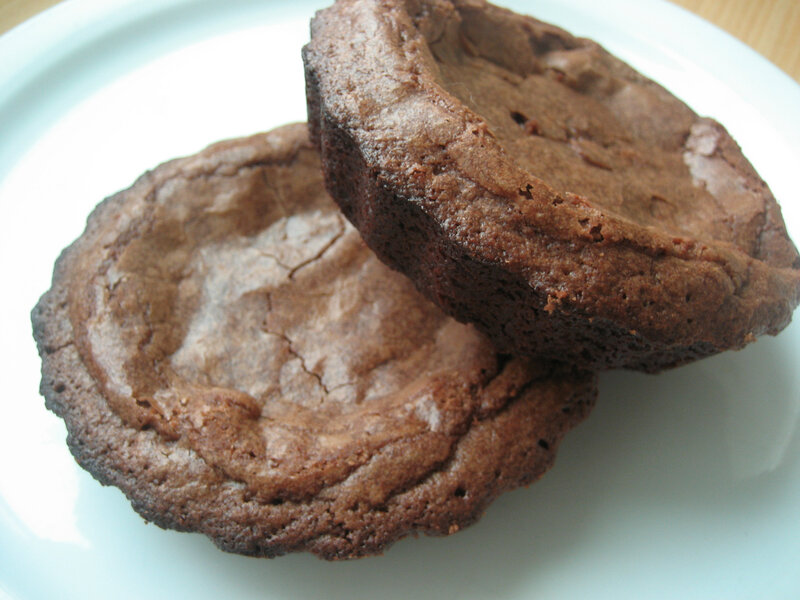 Thanks to Tanya of Chocolatechic for selecting today’s recipe. Dorie suggested that they should be a little gooey in the middle. I think I may have overbaked mine a little but regardless they were very tasty. I also cheated as I only had bittersweet chocolate on hand. Otherwise, I followed the directions and resisted the temptation to add white chocolate chips. In my world, you can’t ever have too much chocolate so maybe next time I will add them. I was pretty excited about this weeks Tuesdays with Dorie because many moons ago, Caroline bought me some mini bundt pans, which I had never used before today! So, thanks to Kristin of I’m Right About Everything for choosing this weeks recipe and forcing me to try out the pans! I made a few changes to the recipe to fit my current supplies (I am still trying to figure out why I have 3 bags of white chocolate chips in my cupboard) and preferences. I only made half a batch because I only have 4 bundt pans. I also left out the nuts because, I’m sure if you have read the blog before, we are not big on nuts in baking here at Bake with Us. I subbed in white chocolate chips due to my aforementioned over-abundance. I also opted not to make the glaze. This was because a) I am lazy b) I’m not serving it until tomorrow night and c) the bf likes raspberries so I’m thinking of making a raspberry sauce to go with them! I’m looking forward to trying this and will keep you posted on my thoughts! 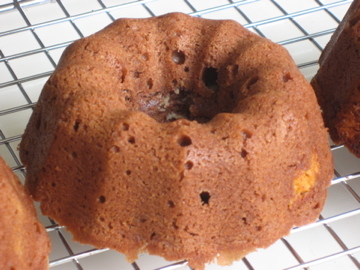 Be sure check out some other TWD bakers for more Milk Chocolate Bundt goodness.